Engraving (with etching? 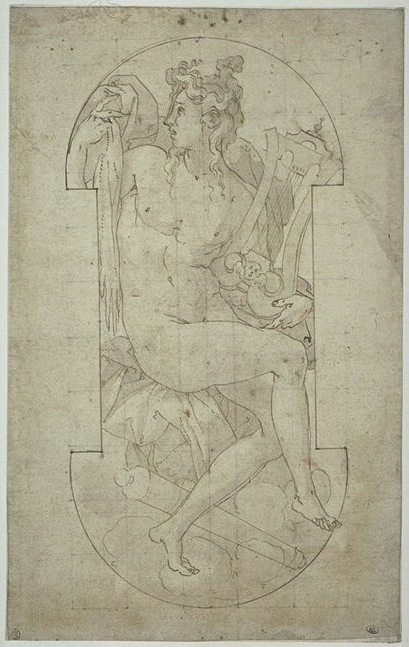 ), Anonymous, 26.1 x 14.2 S.
COLLECTION: Paris, Ed 2h petit in-folio, as Du Cerceau, the four corners cut; inscribed in ink at the lower left: 6239. LITERATURE: Apparently unpublished unless this engraving (with etching?) at the Bibliothèque Nationale under Du Cerceau is the print given by Geymüller and Herbet to Du Cerceau but which would more appropriately be the etching E.60. This print is based on Rosso’s drawing in the Louvre (Fig.D.76Aa), which seems to have been made for his decoration of the Salle Haute (L.43) in the Pavillon des Poêles at Fontainebleau. The print is in the same direction as the drawing. In the engraving the outline of the area containing the figure in the drawing has been eliminated and the image has been slightly extended to fill the rectangular area of the print. Details of the figure, drapery, and clouds have been slightly, but only slightly, elaborated in the print. 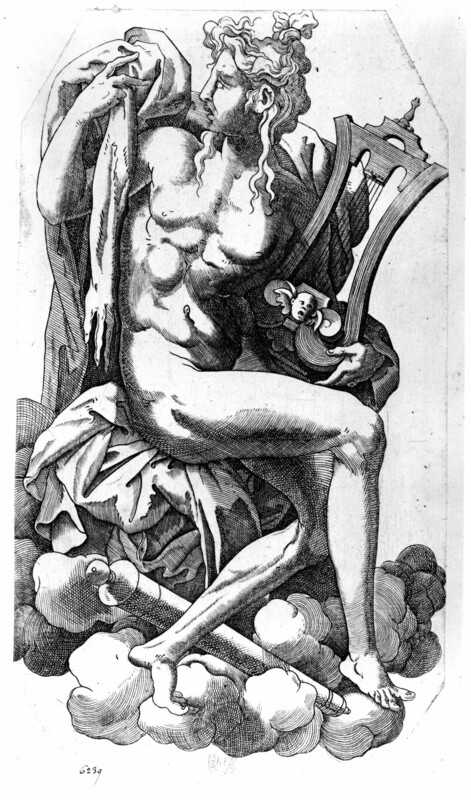 The flayed arm and hand of Marsyas in the drawing are more clearly identifiable in the engraving. As an engraving, even with etching, the print would not seem to be by Du Cerceau, under whose name it is kept in Paris.